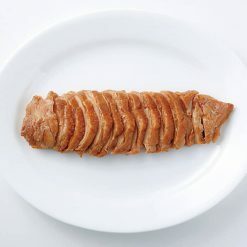 The chicken breast meat was seasoned with a soy sauce-based sauce, and then sliced into pieces. While there are many different kinds of soy sauce forms available widely throughout Asia, Tamari is a specifically Japanese form of soy sauce, traditionally made as a byproduct of miso paste. Tamari tends to have a darker color and richer flavor than the common soy sauce you might be used to, with less salt and less gluten. However, please be advised that this product is not gluten- free. Product totals 100g (11-15 slices). The chickens were raised and carefully nurtured over an 80 day period to develop a rich, firm texture in their breast meats. The chicken breasts were flavored using tamari seasoning with soy sauce, then steamed. The chicken is already sliced – simply serve as it is after thawing. There is no need to labor over the pieces by getting the kitchen knife or cutting board dirty. There are about 11-15 slices per product package. The variation is due to the different weights of the slices. The slice widths come to about 6 mm. It is possible to thaw the chicken meat in its bag in the refrigerator. If you are in a rush, you may also place the bag under running water. Enjoy alongside your favorite vegetables, in a salad. You may also use the breasts as a topping for noodles, etc. This product contains chicken breast meat (domestic), tamari soy sauce, syrup, soy sauce, sugar, tapioca starch, fermented seasoning, salt, (some of the raw materials include wheat flour) .